In researching history, I find there are some really dramatic occasions. Catherine of Aragon’s speech at the Legatine Court of Blackfriars on June 21, 1529 is one of those moments. King Henry VIII was hell bent on marrying Anne Boleyn and was in search of any means available to extricate himself from his marriage to Catherine of Aragon. Catherine, being the proud daughter of their Most Catholic Majesties Queen Isabel and King Ferdinand, would be her own most staunch advocate. Henry VIII had asked Pope Clement for an annulment of his marriage to Catherine. But before he could do this, in May of 1527, Rome was sacked by the Imperial troops of Holy Roman Emperor Charles V, who just happened to be Catherine’s nephew. The Pope was to spend the rest of his life avoiding conflict with Charles. He was compelled to make decisions that would not offend the Emperor even though this resulted in reducing the power of Papacy. Also, according to church doctrine, a valid contractual marriage could only be dissolved by death. And the Papacy had issued a dispensation for the marriage of Henry and Catherine. It was not in the Pope’s power to annul a marriage where an impediment had already been dispensed. In April of 1528, Pope Clement issued a papal bull giving Cardinal Wolsey the authority to handle the King’s Great Matter in England. 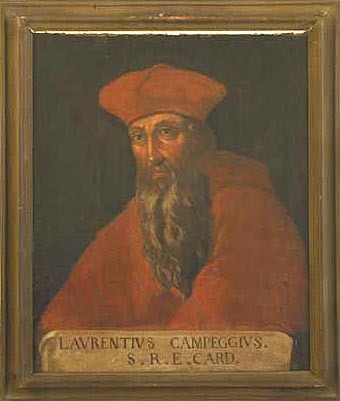 He also dispatched the aging and ailing Cardinal Lorenzo Campeggio to England to look into the claims. However, the Pope had instructed the Cardinal to delay any decision as long as he could so as not to offend the Queen’s nephew, the Emperor. Campeggio’s journey took many months. 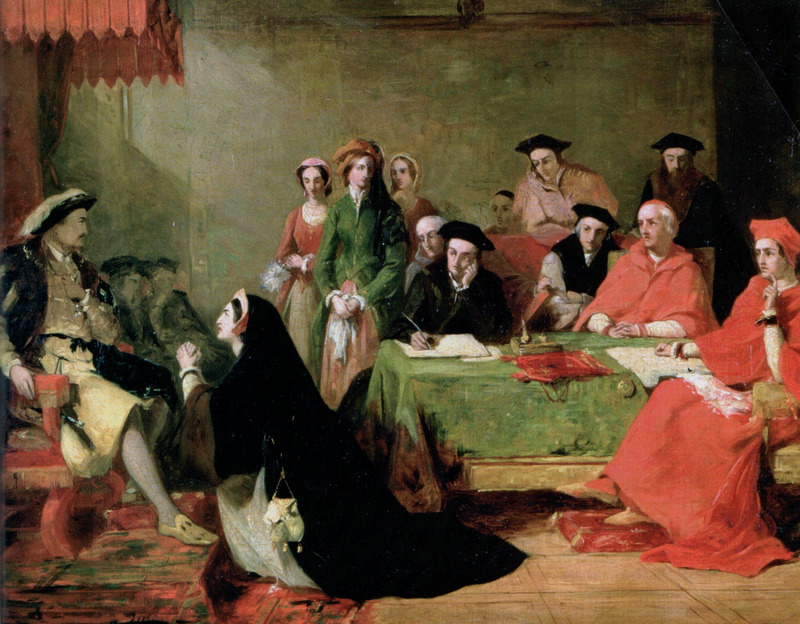 A Legatine Court was finally convened in June of 1529 to hear the arguments regarding the annulment. Catherine is invoking the memory and the value of their longtime relationship. She pleads that she is a woman and a foreigner having no friends. Unable to get unbiased counsel, she is appealing to the king as the head of justice in England. She asks how has she offended him? She was a loyal and obedient wife, loving all the people that the king loved, whether they were her friends or her enemies. She reminds Henry that they had many children but God saw fit to take all of them away except for their daughter Mary. She says these deaths were not her fault. Catherine reiterates that she was a virgin when she married Henry. She says if she has broken the law, then she deserves whatever treatment she gets. But if she hasn’t, she asks to be restored to her former estate. Being very shrewd, she refers to Henry’s father, King Henry VII and how wise he was, as wise as Solomon. She also refers to her own father King Ferdinand and how these sagacious kings brokered their marriage believing it was valid and lawful. How could he bring up these invented regulations against her when she was acting in all honesty? Why did he intend to cause her harm and subject her to cruelty? She says she will be accused of not giving sufficient answers to Henry’s claims. The blames for this, she believes, is because she doesn’t have objective advisors. She doesn’t trust the king’s advisors because they will not go against Henry’s will. She doesn’t believe she will get a fair hearing on her case in this court and requests more time to consult with her friends in Spain on how to proceed. If he will not agree to her request, that is his prerogative and she will appeal her case to God. During her speech, Henry tried twice to have her rise off her knees. She never wavered. When she was finished, she did not go back to her original seat but walked out of the court on the arm of Master Griffith, her General Receiver. Henry demanded she be called back into court. The crier called out “Catherine Queen of England, come into the court”. Master Griffith turned to Catherine saying they were calling her back into the court. Her response was “On, on, it maketh no matter, for it is no indifferent court for me, therefore I will not tarry: go on your ways”. And Catherine departed never to appear in any court again. Catherine did file an appeal to Rome as she promised. On June 28, John Fisher, Bishop of Winchester delivered a speech saying Catherine and Henry’s marriage was holy and good and could only be dissolved by God. This speech would eventually cost Fisher his life. Campeggio offered no definitive judgement and dissolved the court on July 31, saying it would meet again in October. The court was never reconvened. Catherine’s dramatic speech had won the battle in the short term but she lost the war. Becoming exasperated with Rome, Henry eventually broke with the Catholic Church and declared himself the head of the church in England, allowing him to annul his own marriage to Catherine and wedding Anne Boleyn. It comes across as a very well-written and indeed dramatic speech. Do you happen to know whether she wrote it alone or with help? I believe she was well-educated enough to do the former if necessary. I don’t have any historical evidence on this Caecilia but I believe she wrote it herself. As you say she was well-educated and highly intelligent. And she believed in her own cause. Just discovered this site, by accident. Love it! No wonder King Henry never showed up for Anne Boleyn’s trial years later! He was too traumatized after Catherine’s speech! Great post, thanks! Hi, i am enjoying your research so much, thank you! Catherine’s speech was so powerful I think that is why King Henry never showed up to court for Anne Boleyn’s trial years later. He was too afraid after what happened with Catherine! Great post, thanks again! This is an amazing piece of history!!! Thank you!! I love the way she tells him that he knows that she was a virgin when they married. If he had discovered that she was not, surely he would have had to ‘divorce’ her there and then, since that was the basis for the papal dispensation. Her parents very shrewdly drew up the documents saying he had to marry her whether she was a virgin or not so they had that covered. I don’t know much about it, but did he ever suggest that she wasn’t a virgin when they married? That would surely have solved his problem. No. There was never any suggestion of that. The early years of their marriage were very good. Catherine was his equal intellectually. It was only when she lost the ability to have children (and Henry met Anne Boleyn) that the trouble began. Thank you. It must have been a very frustrating situation for both of them. It seems this was a very eloquent speech, delivered under extreme pressure. Kneeling throughout the speech was a stroke of PR genius. And she had no TelePrompTer to remind her of her lines! But Henry wanted what he wanted, no matter what. Oh, well, one can’t reason with a man in his mid-life crisis, especially when there’s a prettier and younger version already waiting.